This limited release collaboration beer between Storm Brewing and Russell Brewing has been around for just a few months. Producing one of the first of a slew of collaboration beers that have been released over the past several months, brewmasters Jack Bensley (Russell Brewing) and James Walton (Storm Brewing) are pioneering a kinsman-like spirit for the Vancouver craft beer community. 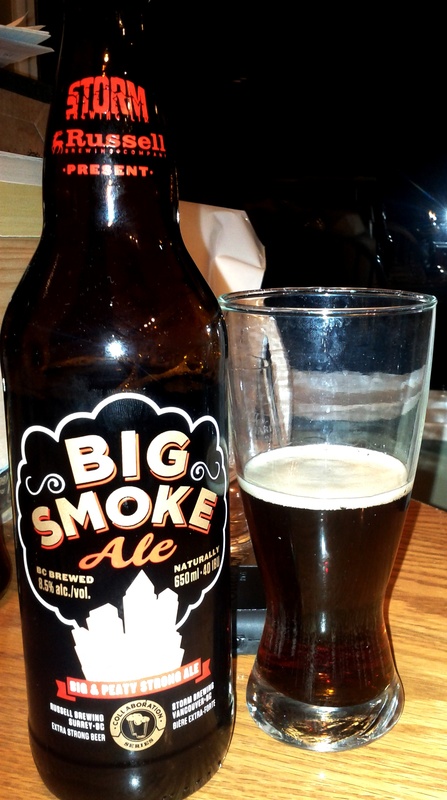 The name Big Smoke is derived from its unique approach to beer fermentation: using peated malt! Well, some peated malt — 10% to be exact. If you’re unaware, peat is vegetation that is primarily used in Scotland to dry barley malt. This technique, using peat fires, is especially used in Islay single malts, and gives it that characteristic vegetal flavour — grass, moss, dust, dampness, etc.. It’s a little difficult to describe, but quite obvious once you’ve tried a peated whisky. Because of its association with drying of the malt in peat fires, peat flavours often come in tandem with a smoky quality. Peat is, in fact, often mistaken for smoke; truth is, while these two aspects typically come hand in hand, they are not inextricable — there are some very smoky, lightly peated whiskies, as well as some highly peated, lightly smoked whiskies, but this is all relative. When it comes to beer, peated malt is unusual, but can be quite the pleasantry for a whisky drinker. Some other peated beers include Unibroue’s Raftman, Williams Brothers Fraoch Heather Ale — where the peat and heather come in part from the water sources of Scotland, and, though not actually using peat, (whisky) barrel aged beers — Phillip’s Double Barrel Scotch Ale, Driftwood’s Singularity etc. — tend to give off some peat flavour. Besides the peat, the Big Smoke is a heavy, malty, thick, dark, high percentage beer; a true sipping beer that’s not for the faint of heart. Amidst the light, effervescent peat smoke aroma is a solid malt backbone. As a single-malt enthusiast who loves his peaty scotches — Ardbeg, Laphroaig, Ileach, etc. — I was rather disappointed that the peat does not shine through as much as I’d hoped. In fact, the malt all but overwhelms the notes of peat. That said, with careful concentration, one may extract moments where peat instilled flavonoids connect with one’s receptors. The feeling is quite pleasant, however, this is much too much work, and I don’t want to have to pay such careful attention to access the best parts of a beer; these parts should be the forefront of the beer. While the body is enjoyably creamy, the beer is quite heavy. You certainly don’t want to be drinking more than one of this tallboy bottle badboy. Though not considered a stout, it reaches certain stout-like parameters — heaviness, thickness (the definition of stout), and darkness. While the malty taste is excellent — especially the initial flavour — it does not last; the finish, while retaining the taste of alcohol, loses its sweet malt flavours. All things considered, the Big Smoke is an exceptional beer, and while not fitting for all occasions, there are some instances — perhaps while sitting in front of a fire on a cold night — where it would be perfect. So, don’t miss out on it while it’s still around! As you can tell, Kamran has left little room for expansion on this particular beer; I suppose he really enjoyed it! Just along the basics of this beer then, I found it to be one of the best beers we had that night. The nose was a rich malt that, while stronger than the peat notes, was still an enticing factor to salivate for this beer. The body was a thick and heavy combination that went down creamy and smooth, much like certain stouts. The taste was naturally malty and slightly peaty to my senses, but it also possessed a slightly cocoa-like flavour. The finish is a brief encounter to say the least. It fades rather fast for my liking, but it is a smooth malty presence that is enjoyable prior to dissipation. This beer is one I’ve had on a couple of occasions since the tasting, and I have to say, it is a nice treat to have and even share late at night. Well done Russell/Storm, but you’ve now set a high standard for any future collaborations!! !